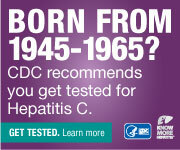 Get an overview of Hepatitis and learn more about the three main viruses: Hepatitis A, B, and C.
new mobile & web app! "Newly diagnosed Hepatocellular Carcinoma in patients with advanced hepatitis C treated with DAAs: a prospective population study". Race/ethnicity and insurance status disparities in access to direct acting antivirals for hepatitis C virus treatment. Hepatitis C virus eradication by direct-acting antiviral agents improves carotid atherosclerosis in patients with severe liver fibrosis. The information provided on this site is intended to support, not replace, the relationship that exists between a patient and his/her physician. Hepatitis C Association does not display commercial content or receive funding from advertising products or services. © 2017 Hepatitis C Association Inc, All rights reserved.